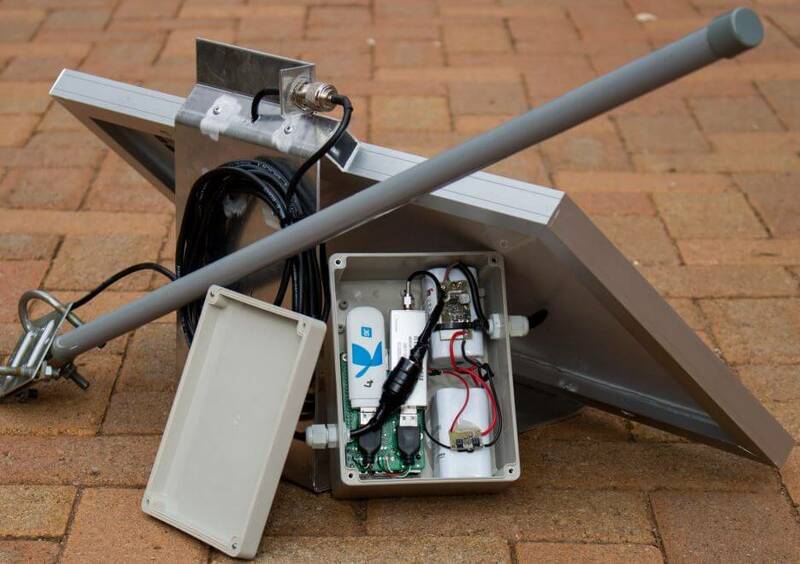 At the North-West University in South Africa Masters student SW Krüger submitted his dissertation titled “An inexpensive hyperbolic positioning system for tracking wildlife using off-the-shelf hardware” back in May of this year. Recently it was found online and can be viewed here (large pdf warning). In his thesis Krüger explains his experiments with using RTL-SDR dongles to set up a very low cost wildlife monitoring system using TDOA (Time Difference of Arrival) techniques, and very low power beacons on the animal tags. TDOA is a difrection finding technique which involves using multiple receivers spread out over a region and calculating the difference in time from when the signal arrives at each receiver. With this information the position of the transmitter can be determined. Typically to do this the system clock in the computing hardware and OS needs to be synchronized as perfectly as possible between receivers, otherwise timing difference will cause huge errors in the position. Krüger uses synchronization bursts from a beacon, but notes that a real-time clock or GPS module could also be used for accurate time keeping. In his experiment he set up two RTL-SDR receivers spaced 9 km apart and was able to obtain an accuracy of about 3.5m, which he writes is similar to other wildlife positioning systems that use tags with much higher power consumption. The computing hardware used at the RX station is a Raspberry Pi 3 powered by a 20W solar panel and batteries. There is also a wireless 3G modem for communications. The DSP software produced for the project is all open source and available on GitHub. The RX System with RTL-SDR, Raspberry Pi, Mobile Broadband Modem, Power Supply and Solar Panel. How large is the animal tag? I’ve got an application that this might work well for if small enough. If animal were below ground would it still work? Author here :). I never thought someone would come across this research. Thank you for the amazing rtl-sdr.com dongles that enabled this research. BTW, we used a similar trick with reference transmitters for a low-cost correlated antenna array. That experiment is still a work in progress, but you can see some (old) initial results at http://antennaarray.co.za/. The software for that is open source as well and available at https://github.com/swkrueger/corx. This is a really exciting advancement! I’m a biologist and actually a member of the Cornell group which created the TDOA system you referenced in your thesis (though I was not involved in the development of that system). I just want to thank you for making your design open-source so that those of us who want to adapt it, use it, or further develop it can do so. There’s a tremendous amount of wasted effort as different lab groups design proprietary systems to accomplish similar goals. I am currently writing an opinion piece about the need for open-source engineering for biological research and I would like to highlight your study as a prominent example of the benefits: it’s hard to argue against a simultaneous reduction of cost of 1-2 orders of magnitude and a two-fold increase in accuracy. hmmm sound good but how to deploy such an System in an Mountain Area where reflection could happen? You can work around reflection as long as you have a strong peak along the LOS path. Even if the signal is stronger along a secondary path than the LOS path, you can still do some filtering to extract the TOA along the LOS path. Multipath propagation along paths that are only slightly longer, such as in a city, is a problem though since it widens the correlation peak and increase the uncertainty as to exactly when the LOS signal has arrived. Outstanding paper and applicable in many locator scenarios. Is there any info available regarding the receiver power supply setup? I’m interested in how the solar panel/battery is managed. Really cool, that 3G dongle looks way too close to the SDR for comfort though. Even if just from the 3g dongle’s perspective. I’d have looked for something I could put panel mount pigtails on. If exposure to the connectors is an issue, then you just need a better connector on the external side. That was one of my concerns too. When we tested it we used USB extension cables to create some distance between the RTL-SDR and the 3G dongle. It didn’t make much of a difference though.